Recently, the use of certain environmental-friendly waxes or "semi-hard coatings", used by barge fabrica- tors to protect the internal void walls and floors of marine double-hulled steel barges from corrosion, have fallen under scrutiny by some barge owners/operators. Paints, Inc. "beeswax" coating by two independent lab- oratories. The research confirms that the wax coating is of the highest quality, effectively mitigates corro- sion, and does not introduce nor promote the growth of microorganisms when properly applied in barge voids. Allegations that beeswax coatings support MIC in barge voids must be with regard to other hydrocarbon type waxes. The void space between the outer and inner walls of double hull barges used to carry various cargos (i.e.. grain, aggregate, salt, coal and hydrocarbons) is often susceptible to condensation and resulting corrosion. The voids in barge compartments are accessible by opening sealed watertight hatches and climbing down fore and aft ladders for periodic floor and wall integri- ty inspections. Voids should be kept clean and dry. U.S. laboratories and found to be sterile of microor- ganisms in the virgin state and not susceptible to microbial degradation in barge voids. 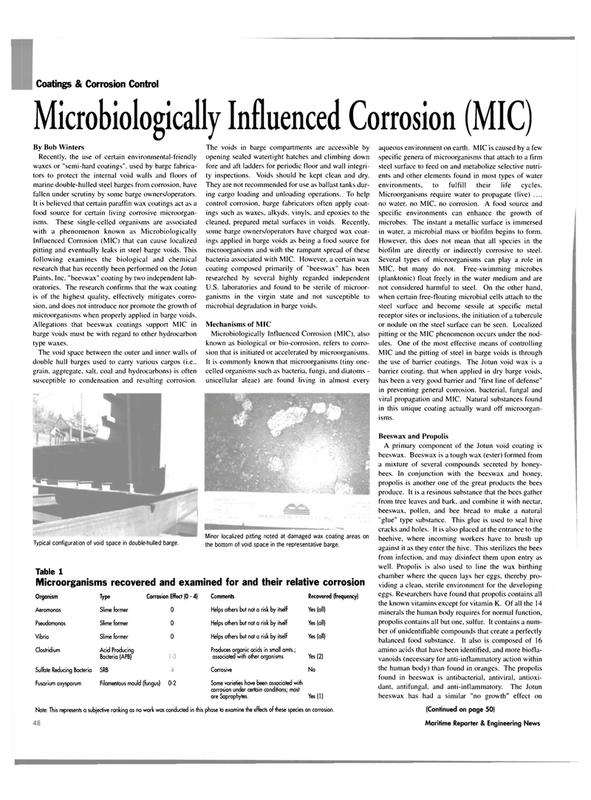 Microbiologically Influenced Corrosion (MIC), also known as biological or bio-corrosion, refers to corro- sion that is initiated or accelerated by microorganisms. Typical configuration of void space in double-hulled barge. Minor localized pitting noted at damaged wax coating areas on the bottom of void space in the representative barge. Some varieties have been associated with corrosion under certain conditions; most are Saprophytes. Note: This represents a subjective ranking as no work was conducted in this phase to examine the effects of these species on corrosion. aqueous environment on earth. MIC is caused by a few specific genera of microorganisms that attach to a firm steel surface to feed on and metabolize selective nutri- ents and other elements found in most types of water environments, to fulfill their life cycles. Microorganisms require water to propagate (live) .... no water, no MIC, no corrosion. A food source and specific environments can enhance the growth of microbes. The instant a metallic surface is immersed in water, a microbial mass or biofilm begins to form. However, this does not mean that all species in the biofilm are directly or indirectly corrosive to steel. MIC and the pitting of steel in barge voids is through the use of barrier coatings. The Jotun void wax is a barrier coating, that when applied in dry barge voids, has been a very good barrier and "first line of defense" in preventing general corrosion, bacterial, fungal and viral propagation and MIC. Natural substances found in this unique coating actually ward off microorgan- isms.